GOLDEN, CO--(Marketwired - Jan 8, 2015) - iSatori, Inc. (OTCQB: IFIT), an emerging leader in the development and marketing of scientifically engineered nutritional supplements for healthier lifestyles, today announced the entrance of Energize, the number one selling* energy pill in America, nationally into CVS Health, a pharmacy innovation company helping people on their path to better health through their over 7,800 retail outlets. Energize's time-released tablet formula is clinically tested in three double-blind, placebo-controlled, randomized studies (the "gold standard" of research). Energize offers consumers longer lasting energy than competing liquid energy products and coffee, without the bitter taste, at about half the cost of leading energy shots. This establishes a unique position and consumer value within the popular, and growing, $18-billion** energy category. "We are excited by the increasing demand and availability of Energize," commented Stephen Adelé, founder and Chief Executive Officer of iSatori. "CVS is a key strategic retail partner as we continue to press forward on the momentum obtained from the increased distribution and demand in the Food/Drug/Mass Market, which has become a strong, predictable segment of our ongoing business." Rick Anderson, Executive Vice President of Sales at iSatori, excitedly commented, "Adding CVS to our retail mix now affords our consumers the benefit of finding Energize in the top mass market retail outlets nationally throughout North America, including Walmart, Walgreens, Rite-Aid, Albertsons, and Meijer. We will continue to seek additional distribution for Energize and provide consumers with more options to purchase and benefit from our best-selling energy product." The Company expects to fill national purchase orders from CVS pharmacy stores in April 2015 and be on shelves for consumers within a few weeks thereafter. To learn more about iSatori and Energize, locate the nearest retailer, or receive a $2 off coupon, please visit www.TryEnergize.com. To sign up to receive iSatori ("IFIT") most recent news and updates via email, please visit http://www.isatori.com/Email-Signup-C2041.aspx. * Information Resources, Inc. (IRI) Data - US Multi-outlet report, July 2014. ** Nutrition Business Journal; 2013 SNWL Annual Report. 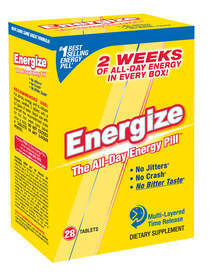 Energize offers consumers longer lasting energy, without the bitter taste, at about half the cost of leading energy shots.